This story does not take place on the sprawling American base at Ledo or in the steamy jungles of Burma or among the terraced rice paddies of China, but in New Jersey, U.S.A. It’s the story of how I came to create Remembering the Forgotten Theater of World War II on the Worldwide Web. I have been involved with computers for over 30 years, since the state of the art was a computer with a 20 megabyte hard disk drive and a 5¼" floppy disk drive. Programming always interested me and I wrote several Basic programs, some of which came to be used on a small scale by others for various specific purposes. 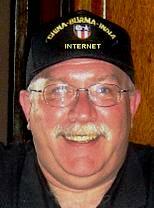 When the Internet explosion began, I of course also became interested in creating web pages. It wasn’t a priority and for several years I "surfed" the web like everybody else. A change to high speed Internet service gave me the opportunity to create a personal web page. That first web site was one about my family that basically consisted of filling-in information into a page that the Internet service provided. I wanted to be able to create my own web page, one that looked exactly like I wanted. I stopped at a bookstore and picked out a couple of books on HTML (HyperText Markup Language, the programming language for Internet pages). Using the books as reference I experimented with making my own page. At about the same time I had been searching sites about CBI, the theater of war where my father served during World War II. Although I had 38 years with him, he never talked much about his service and I never pressed to hear about it. He passed away in 1994 and so his first-hand information was lost forever. Many others that have contacted me over the years have indicated their father’s were much the same way, not saying much about their years of service during the war. I knew my father had served in the CBI Theater because he regularly attended veteran’s association meetings. One of Dad's photos from Assam. Stored away in a closet of winter coats and old clothes was his uniform jacket. I went to my mother’s house and asked to see everything she had from Dad’s CBI service. Most of what she had were pictures he had sent back to his father. There were also his military records, Discharge and some other documents. I took pictures of his uniform jacket and borrowed the photos to scan. Most of the pictures were small, about 1½" by 2½" – I didn’t hold out much hope that they would reproduce well. I asked my mother for any information she could share, but she too had not spoke much with him about CBI. She knew he was in Assam and that was about it. All three things finally came together. The ability to create a web page, the knowledge provided by the books I had purchased, and an interest in my father’s World War II service. The result was my first original Internet page. I called it A Tribute to My Dad. It consisted of the pictures I had scanned (which after being scanned and enlarged contained much more detail than I thought they would) and the photos of his uniform jacket. I also included some history of the CBI for anyone visiting who might not be familiar with that theater of war. There was one large picture that Dad had. It hung for years in our "TV Room." 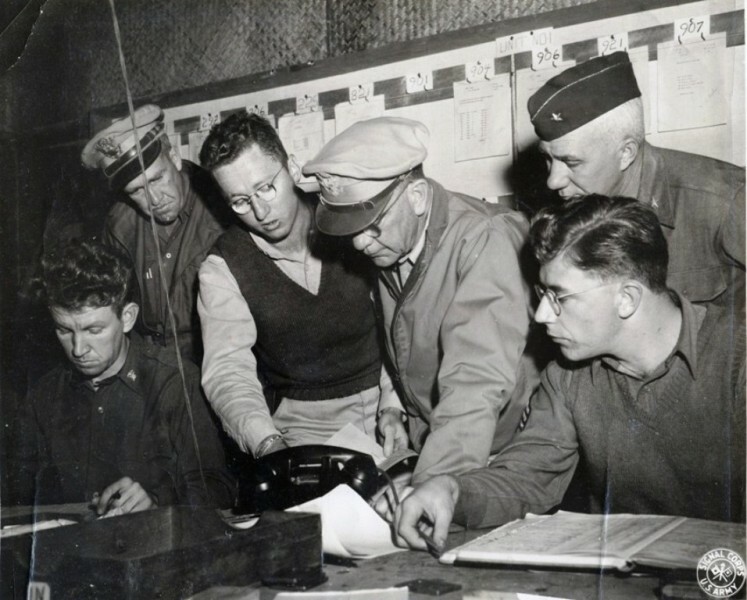 It was a Signal Corps photo and showed Dad seated at a desk with another G.I. Looking over their shoulders were several generals. On the back it identified the persons in the photo. Among them were Generals Wheeler and Pick. Further research and examination of the photo seemed to indicate some of the persons in the photo were not as identified. Below is the photo with what I believe to be the correct persons indicated. AIR SUPPLY DEPOT WHERE SUPPLIES WERE PACKED FOR THE MARS TASK FORCE (JANUARY 1945) Seated, left to right, Lt. James Savage, Sgt. Warren Weidenburner. Standing, left to right, Brig. Gen. Robert M. Cannon, Chief of Staff, IBT, Capt. Robinson, Lt. Gen. Dan I. Sultan, India-Burma Theater commander, Brig. Gen. Lewis A. Pick, Ledo Road commander. Some of the things Dad had saved were unfamiliar to me. One was a "Neptunus Rex" card and several information sheets from Camp Lee, Virginia. Also unknown to me was one of the patches on Dad’s uniform jacket, a triangular patch with three stars on a red field at the top, with a jagged white line running top to bottom in the lower portion that was green and blue in color. I set about searching the Internet for more information. One of the first things I discovered was information on the strange patch from Dad’s uniform. It was the Ledo Road shoulder sleeve insignia. According to the web sites I found about it, it was worn by men who had served along the Ledo Road. Okay, but what was the "Ledo Road?" I searched for information on the Ledo Road. Most pages I visited indicated "see Burma Road" and then described in various detail the blockade of China and the function of the Burma Road, the Ledo Road, and the Stilwell Road. Three roads? Now I’m really confused. What I had to do was piece together the information from several sites to get the whole, true story. I decided then to make another page about the Ledo Road that would tell the story in one place and bring together the pictures I had found on various sites that documented activities along the road. It grew into what I believe is the largest single source of information about the Ledo Road on the Internet. Incidentally, I found that there weren’t three roads, but rather (as I indicate on The Ledo Road) "Three Names – Two Roads – One Purpose." So now I knew that Dad had served along the Ledo Road. According to his military record, his MOS (Military Occupation Specialty) was 502, Administrative NCO. The caption of the large picture indicated it was taken at an "Air Supply Depot where supplies were packed for the Mars Task Force." The photo was taken in January of 1945 and the Mars Task Force was indeed in action in Burma at the time. They were a long range penetration force and were supplied completely by air. 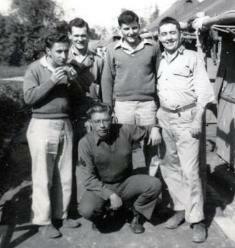 Although Dad was involved in supply, he was not in the Quartermaster Corps. The section of his military record that would indicate "Arm of Service" service is blank. I concluded that he was one of the thousands who worked to support construction of the Ledo Road. Indeed it can be said that everybody stationed in Ledo worked to support "The Road" and that was the whole purpose of being there. The mission of the CBI Theater can be simply stated as "to keep China in the war." It’s estimated that between 800,000 and one million Japanese soldiers were occupied in fighting in the Far East. Had China succumbed to Japanese control, many of these troops would be free to move to other fighting fronts, complicating the Allied war effort and no doubt prolonging the war. From the Flying Tigers who were first to fight in China and the China National Aviation Corp. (CNAC) first to fly supplies over "The Hump," every action in the CBI can be attributed to the "keep China in the war" mission. The Ledo Road (on the Internet) led me to two CBI produced booklets, Stilwell Road – Story of the Ledo Lifeline and Yank’s Magic Carpet. I transformed them from small 60-year-old booklets to brand new web pages with more of the history of the Ledo Road and the CBI Theater. As this was happening, people started sending me e-mail about their service in CBI. Sons, daughters, grandchildren, nieces, nephews, friends – all sent me information. Some was only a paragraph, some was detailed stories, photos and documents. Relatives thanked me for putting the information out there for all to see and some sent more information to increase the information available. All of this led to more and more web pages. 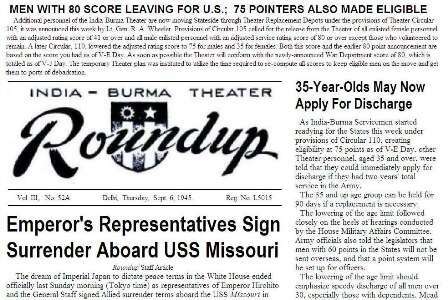 One of the more interesting pieces of CBI history I received was several copies of Roundup, the theater newspaper of CBI. It was full of history about CBI and also about G.I. life in China and India. I was presented with a problem: how to present this newspaper on the web. The paper was too big to scan and even if I pieced several scans together the result was a good copy of a yellowed newspaper with type that had become more gray than black in the years since it was printed. Two examples of Roundup on the Internet. The web pages closely resemble the original newspaper. I decided to apply the same method I had used on the small booklets – scan the photos, re-type the stories and put them together into something that looked like the original. It worked. More CBI history preserved and available for all to see. I call it Roundup Online. 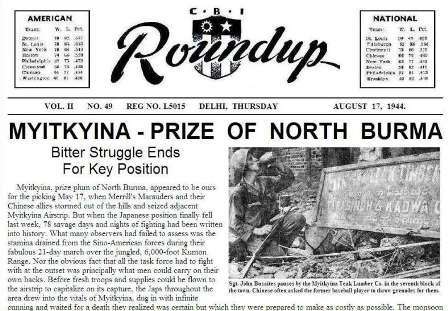 As of May 1, 2018, there are 181 of the original 188 issues of Roundup recreated on the Internet. I am always hopeful that the rest can be found. What started as an interest in web pages and my father’s service in CBI, eventually grew into the site it has become today. There are literally hundreds of web pages of CBI-related information available from the menu of "Remembering the Forgotten Theater." While many have thanked me for what I have done, it would not have been possible without the many veterans and friends of CBI who have shared their piece of CBI history. And of course none of this would be possible without the men and women who served in "The Forgotten Theater of World War II."